Even though I’m not that much of a clock person, the Solar Time Clock is stunning. In our lifetime, nothing as complex as this clock has been attempted, and the clock incorporates features that have never been incorporated into a mechanical clock, so it’s truly a unique masterpiece. Just to give you an impression of the complexity, a little look at the movement, which is dominated by a large cam. This supplies the data for the sunrise and sunset between the two polar circles, depending on the latitude. So the equator is in the middle of the cam, represented by a circle. As we move towards the polar circles, the day/night difference gets more and more pronounced. 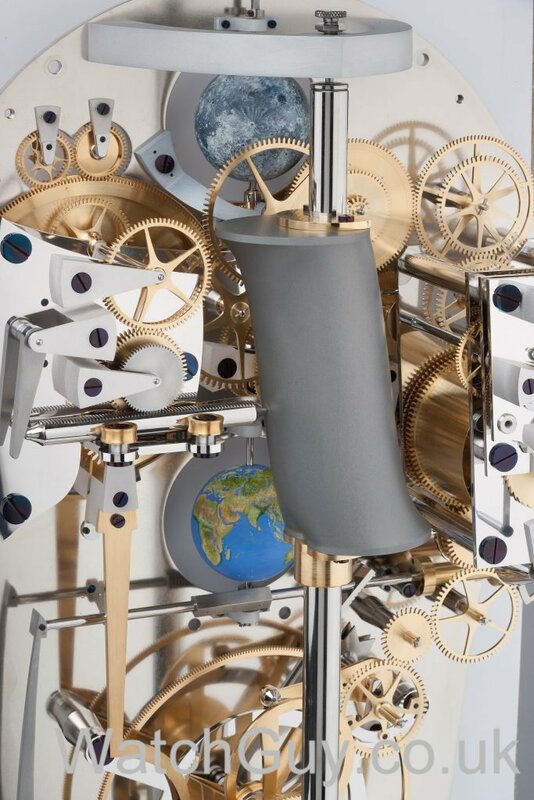 This cam drives through an ingenious construction the shutters that show the day and night length on the clock face. At the bottom of the photo, you can see a pretzel-shaped cam, that is responsible for the equation of time correction. A view from the top of the movement. On the top left, you can see parts of the shutter mechanism that shows the day and night length. Also visible is the moon and earth, indication the moon phase and the longitude that the clock is set to. So what does the clock do? Once it’s set to the correct time and date, you adjust the longitude and latitude to your position on the globe. Voila, the clock will show you the correct day length, sunrise, sunset, current position of the sun, moon phase, and date. Simple, yet very complicated. It’s not easy to derive that from the movement giving the clock GMT, as you can tell from the photos of the inside of the clock. Two main reasons. Firstly, I don’t like most clocks that are currently built. Either they are replicas of clocks that were built before, or they are modern for the sake of being modern, without adding anything but gimmicks to the indication of the time. 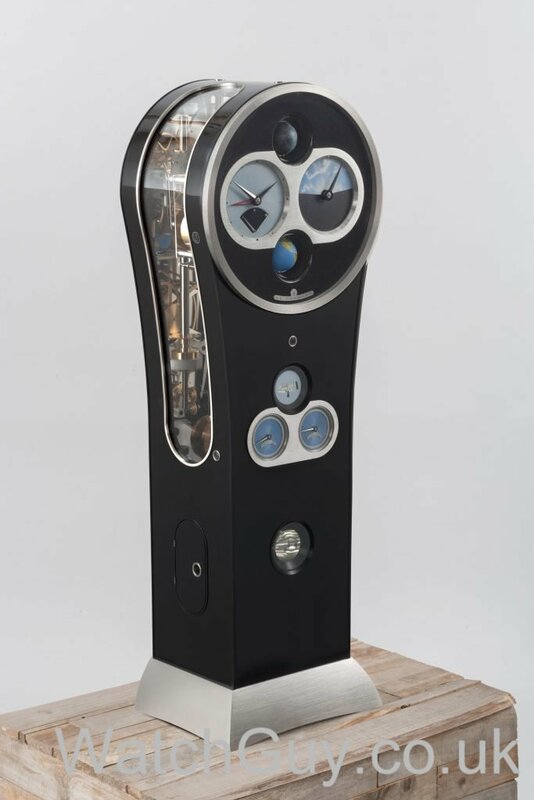 This clock has a contemporary design, with a slight nod to the balloon clock design. It’s firmly in the 21st century, and even hundreds of years from now, people will be able to place it in the correct period just by looking at it. The second reason is that I love what it shows. On the left, we have modern time as we know it since the arrival of the railways, e.g. GMT. On the right, time as humans have observed it from the day since we evolved into thinking beings. Sunrise, noon, and sunset have determined our life since time began. There is no time perception more archaic than solar time. And at the dawn of time, we also looked up to the sky in wonder at the moon, observing its waxing and waning, which the clock also indicates. In my book, a masterpiece in clockmaking. 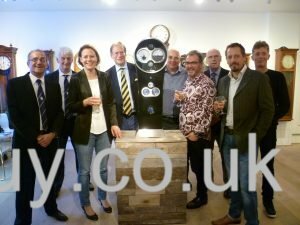 This clock will still be known to horologist all over the world in hundreds of years of time, and they will all mention the de Fossard Solar Time Clock with a little bit of awe in their voices. Now back to my workshop, feeling quite a bit more humble having seen what humans can achieve, but only a very few. I’m not one of them, but George and Cornelia certainly are. Thanks for the write-up. Not much a clock guy either, but it is truly fascinating to try to understand how they have solved some very real challenges! What an amazing masterpiece! It is a piece of art both in function and aesthetics. I simply love the finishes and how they blend harmoniously together in the movement. 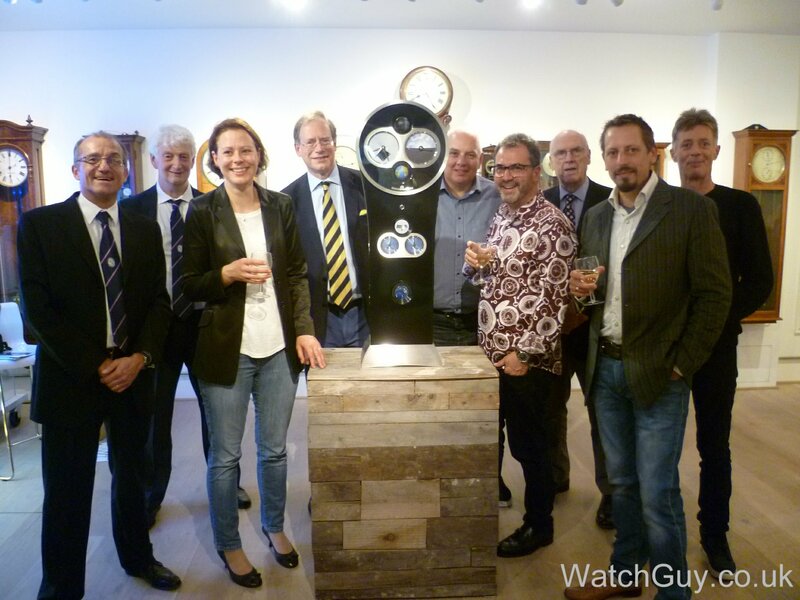 Congratulations Cornelia and George on a magnificent time piece. I am very happy that you, Christian, were able to attend and enjoy the watch in person. Handcraft and the human brain never stops to amaze me. Jens Olsens clock in Copenhagen, which was completed late in the 1950s shows the functions this clock shows and many additional ones. It’s all the more amazing for being designed by a locksmith with no prior education in horology, lest we forget that John Harrison started life as a carpenter. The use of cam actuated shutters to show varying lengths of daylights is first found in Germany clocks in the 16th century and in German watches as early as the 17th Century. 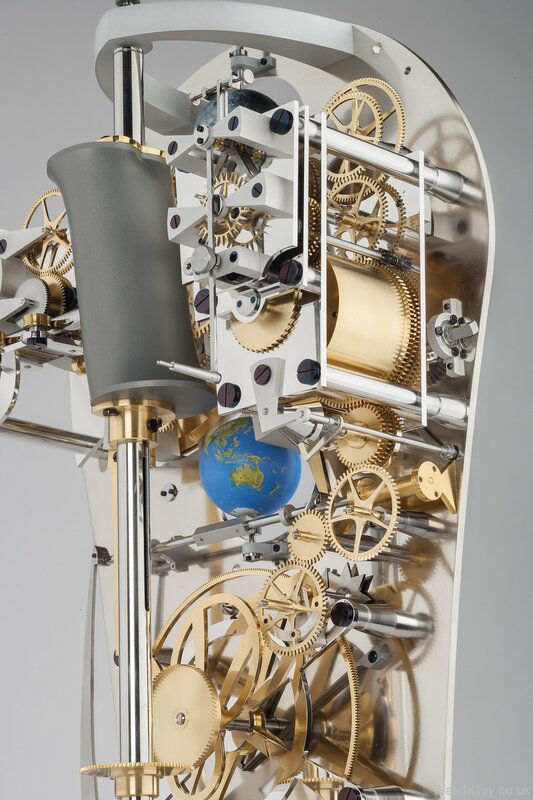 Martin Braun used this mechanism in a wrist watch a few years back to show sunrise and sunset in German latitudes. I’m struck by the beauty and compact formality of this clock,the intense thought, design work and quality of work that has gone into it. I’m sure it’s predecessors will gladly welcome it. Not sure that the clock you refer to has the ability to show sunrise, sun set and noon for any longitude and latitude. That is the unique functionality I am talking about. Oh my, that is a fantastic clock. I’d love to see it up close and in person too! The clock is fascinating. It looked like a nice and happy event. Thank you for sharing!